As you’ve probably already heard, the deadline to submit your comments on the draft South Saskatchewan Regional Plan has been extended until February 28, 2014. If you haven’t already submitted your comments, or if you have more to add, you still have time. 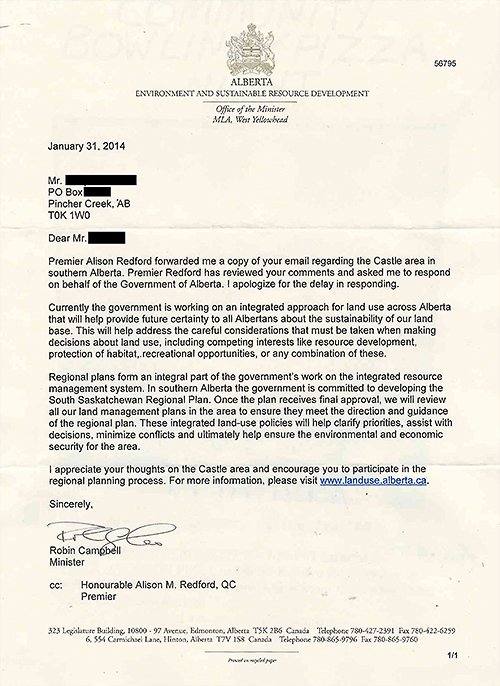 As a follow up, now would be a great time to call or request a meeting with your MLA and speak to him/her directly regarding your concerns about the South Saskatchewan Regional Plan, and about clear-cut logging in the Castle. And why not call Premier Redford as well, and express your concerns. Dial 310-0000 and ask for the Premier’s office. The call is free from anywhere in Alberta. 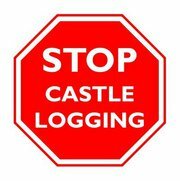 You are currently browsing the Stop Castle Logging blog archives for February, 2014.